There's a world of difference between the flavor and texture of lovingly homemade chili and its canned equivalent. Canned chili is pleasant enough in its own right, but its unassuming taste and smooth, sauce-like texture can be less than enticing. On the other hand, it's ready in mere moments when you want it, which makes it a viable option for days when you don't have time to cook. 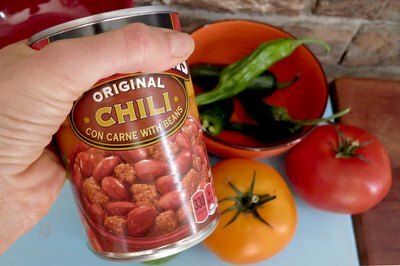 Besides, you can use those few minutes to tweak the canned chili and make it your own. 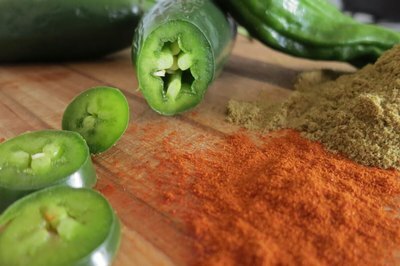 One way to brighten the flavor of canned chili is with fresh aromatics, such as onions, bell peppers and fresh chilies. 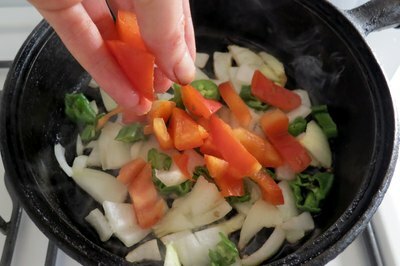 Slice, chop or mince the ingredients, as needed, and start them in a saucepan with a small quantity of oil. Cook them at moderate heat, stirring occasionally, until they're beginning to soften and their aromas start to mellow. Fresh garlic scorches easily, so don't add that until your other ingredients are nearly ready. Once the aromatics have softened, pour in your canned chili and stir until it's heated. The fresh flavors from your aromatics will perk it up considerably. The homogeneous texture of canned chili makes it ideal for spooning onto hot dogs or nachos as a topping, but it lacks a certain something as a meal in its own right. Lending some substance to the chili helps a lot. Brown up a skillet of ground beef -- or turkey or chicken, if you prefer -- either on its own or with fresh aromatics, and drain off any excess fat before adding the canned chili. Feel free to stretch the chili with extra beans as well, either canned or home-cooked leftovers. Add some tart zing to the mixture with diced fresh tomatoes, or with drained and chopped canned tomatoes and canned green chilies. Mass-produced canned chili aims to satisfy the broadest possible range of tastes, which means even the varieties labeled as "hot" have a relatively conservative flavor profile. You can add heat and flavor, as desired, with spices and hotter chilies. That can be as simple as spooning in your favorite brand of chili powder, but you can aim for sophistication instead. For example, toasting some fresh-ground cumin and then mixing it with earthy ancho or smoky chipotle can bring depth and subtlety to the most pedestrian chili. Alternatively, add canned chilies in adobo, or mince some mild poblanos or assertive habaneros. It's your dinner, so you get to decide how much flavor or kick to add. If you're really in a hurry, the quickest way to improve canned chili is by surrounding it with good things once it's heated. For example, you might opt to serve it with a fistful of crackers or tortilla chips for extra substance and a pleasant textural contrast. Enrich the chili with a dollop of sour cream and a sprinkling of shredded cheese, and then sprinkle it with chopped cilantro or add a spoonful of fresh salsa on the side to brighten the flavors. In a pinch, even the heat and tangy acidity of a good hot sauce can make a night-and-day difference. 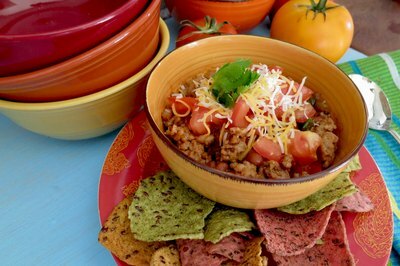 If you need to make the canned chili into a hearty meal, serve Mexican-style rice or warmed flour tortillas on the side. How Do I Get My Beans to Soften in Chili?